Migraine Awareness Month #4: Finding Nemo: "Just Keep Swimming": How do you keep going when Migraine or another Headache Disorder deals you a difficult setback? Finding Nemo has GOT to be my favorite Walt Disney movie. I admit there have been times during my Migraine journey that I have thought about Dori the fish and her famous line: "Just Keep Swimming." It's easier said than done. I often just want to float like a dead fish and let someone flush me. But of course, that's not a very good option. So instead, I am grateful for the support system I have, the support system you'll hear about over and over in this blog, that keeps me going. I wish I could say I have great depths of inner strength that I draw upon and that's how I keep going. I don't. Like a pregnant woman picking a focal point in order to deal with the pains of labor, I have to focus on others, on those around me who I love and who I know love me, to get me through difficult times. Otherwise, I'd give up. I focus on my husband, who even though he could leave, even though no one would blame him, he stays, and he doesn't give up on me. I focus on my niece and nephews, who have my heart, and who I would never want to hurt. I want to be an example for them of strength, perseverance and resilience. I focus on my parents, who go the extra mile, the extra million miles, to do everything they can to restore me to good health. Finally I think of my friends. I have the broadest spectrum of friends you can imagine, from college aged to women in their 80's, and they love me and I love them. They support me and go out of their way to make me feel better. I focus on that. Focusing on these people, these good people, these good things, gives me strength and reminds me I have to persevere no matter how bad it hurts or how difficult it gets. . I also am a strong believer in therapy. It helps me through the difficult times. If you've read this blog much you've heard me sing the praises of my psychologist, Dr. D., but he really has kept me sane over the past 14 years or so. He gives me strength and reminds me of the good things in my life when I am feeling weak. I need that. Everyone needs that. I just focus on the good. I focus on the love. That's how I "Just Keep Swimming." Blogging Challenge Prompt 2: X-Men: Migraine and Headache Disorder Super Heroes: Who in your life goes above the call of duty and how? Wow. This is going to be a hard prompt to write about. Not because it's hard to think of someone, but because it's hard to narrow it down. As unlucky as I feel to have migraines as severely as I do, I am maybe the luckiest, most blessed girl alive to have the people in my life that I do. From family to friends to doctors, I am well taken care of, and so many of those mentioned are willing to go above and beyond the call of duty. First, I have to mention my husband. He didn't choose this life, yet he never complains. When I am in our dark bedroom because I need darkness and stillness but yet I can't sleep, he will come in there to lay with me so I don't feel so alone. How boring must that be for him? When I cry and am scared, he holds me and I know he'd rather be doing something else. His life is boring because his partner is out of commission over half the time, but he doesn't complain. He just gets upset FOR me. Never AT me. He travels to my doctors appointments with me, he helps me decide what meds to take when my brain is to raddled with pain to make decisions for myself. He always puts me first. Again, he NEVER complains. I don't know how he does it. But he is a super hero to me. Second, I have to mention my parents. Without their love, support, and financial help, I couldn't pursue the treatments that I have been free to pursue over the years, treatments that I think are finally showing some results. They step in to help when my husband is out of town and I need someone here, my Mom provides meals, my Dad drives me places when I can't drive myself--I'm still their little girl and they make sure I know it and feel it. They'd do anything for me, and I can't tell them enough how much I appreciate it. Finally, I have a doctor, Dr. D., who literally keeps me sane. He's a psychologist, but he acts more like a primary care physician, talking to my other doctors when need be and keeping all the trains on schedule. I have carte blanche to call him when I need to, which unfortunately for him is probably more than he intended when he told me that. He is probably one of the most pragmatic, intelligent people I know, and he's willing to do whatever I need to ease my pain when I call, be it help me reason through medication options because I'm in too much pain to do it myself or simply provide some mindless distraction until my meds kick in and I can sleep. I don't know how the man keeps up with his other patients, because he spends so much time on me lately. He definitely goes above and beyond the call of duty and I am eternally grateful for it. This doesn't even mention my friends who have been willing to come sit with me when I have needed it, or have been willing to bring meals, or have let me call them and have distracted me from the pain. I am a truly lucky girl in many ways. Just really unlucky in one way. Phantom of the Opera: What I hide behind the mask. June is Migraine Awareness Month, and there are blogging prompts for each day of the month. The prompts for this year are based on a movie. The first prompt is "Phantom of the Opera: What do you hide behind your Migraine/Headache Disorders mask? What do you let people see?" What do I hide behind the mask? I hide everything! I hide when I am in pain. I hid depression. I hide tears, frustration, and fear. You see, I am a people pleaser. It's a fault. Even when I am not being a people pleaser, when I am standing up to someone or something or being assertive or whatever--I'm doing it in a way that I think people like. They think "Oh, look at Julie standing up for people's rights or being strong, or whatever. That's our Julie." So, I can't let people see the bad stuff, the stuff that they won't like. The me that is in horrid pain that makes me wonder how I'm not going to die from it. The me that is so depressed I wonder how I will ever get out of bed again. The me that cries so hard I can hardly breathe. The me that is so frustrated, I just don't want to deal with people, I don't even want to put effort into my health or friendships or family. And I definitely can't let people see the me that is so scared that I will always be this way, that there is nothing that will ever make me better, and that for the rest of my life, my head will torture me and depression, frustration, tears, and fear are just my lot in life. What DO I let people see? There are a handful of people I let see the things mentioned above. A very small handful. But mostly, people see a smiling, happy Julie. They see the mask. I tell them about migraines, but I don't let them SEE the pain and tears and fear and frustration. If the tears ever start, they don't stop. If I show pain, I'm not sure I can control it, so it's best just to not show it. Like Dori said to "Just keep swimming" in Finding Nemo--I have to "Just Keep Smiling" or who knows what hell will break loose that I can't control. The mask is safe. The mask fits. It's been on for so long it doesn't even feel like a mask anymore. How about you? What do you hide behind your mask? I hate to admit I've ignored this blog in large part over the past few months. It's hard to blog about migraines when your life revolves around daily migraines. June is Migraine Awareness Month, and I am going to dedicate myself to blogging almost everyday. I think everyday will be more than I can do, so I am going to aim for almost everyday in the hopes that I can hit that goal. For now though, let me catch you up just a bit. Last I wrote, I was going back to Philadelphia into the hospital. We tried lidocaine there again, and it was a failure. I left the hospital much the same as I went in, in daily pain. The good thing that occurred, treatment-wise, was that I put a bug in my doctor's ear about switching our methodology from the trial and error trying to find the right preventives we've done for the past 15 years, to pain management. He was very much so against treating me with pain management medications at first, but I was at the point that something new had to be done. I had been a guinea pig, basically, since I had been diagnosed with migraines at age seventeen. We try one med, see if it works, try another, and another, and another, just trying to find the right "cocktail" of meds that will control my migraines. Guess what? In 15 years of experimentation, we've not found the right cocktail. It's time for a new method of treatment. So, a month later, at my follow-up appointment, Dr. Y. had come around. He was ready to try pain management. I was shocked. I thought I'd really have to talk him into it, but I think he realized I was getting desperate for relief and what we were doing simply was not working, so it was time. We had nothing to lose. Now it's months later, and we've had to do some trial and error with pain management meds too. I didn't realize that would happen. That was discouraging. But finally, in the past two weeks, we have found a medication that is working. Now we just have to dose it correctly. That's still a struggle because I want to take a ton of it to control my headaches and of course the doc wants to proceed with caution and protect me, as he should. I'm impatient and just ready to feel good!!!! I understand I have to be careful. I just don't WANT to be careful. I just WANT to feel good finally. I'm close. I'm finally close to something big. After a lifetime of migraines, and 15 years of uncontrolled migraines, I'm finally close to having them controlled again. It's hard to be patient. I trust my doctor, but it's really, really hard to be patient! I hope all of you have done well since I last wrote. I will see you more often this month. 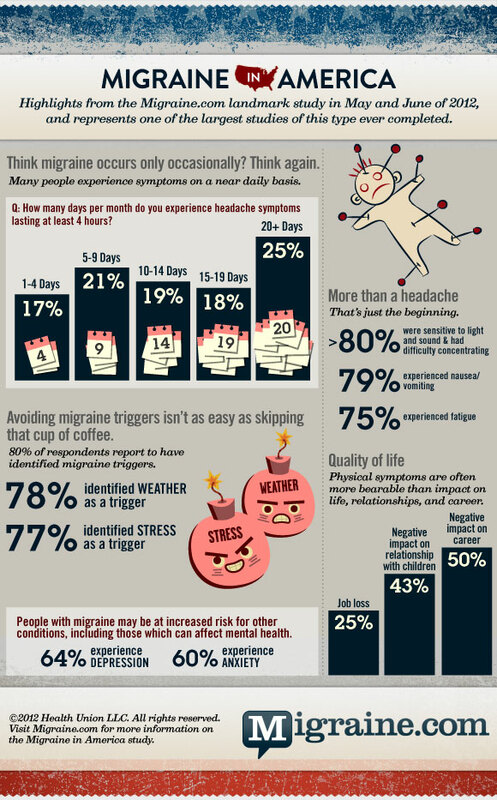 Happy Migraine Awareness Month! Please consider participating yourself. You can blog, as I am doing here. You can post a fact a day to your social media acccounts, or on a post it note somewhere unexpected around town. We have tons of resources and ideas located at http://www.ahmablog.com/mham.html.